There’s a very popular television show in the UK called I’m A Celebrity! Get Me Out Of Here! Frankly it needs very little introduction but it involves dumping a number of down and out ‘celebrities’ in the Australian jungle and persuading them to eat kangaroo testicles. There’s more to it than that of course but you get the picture. 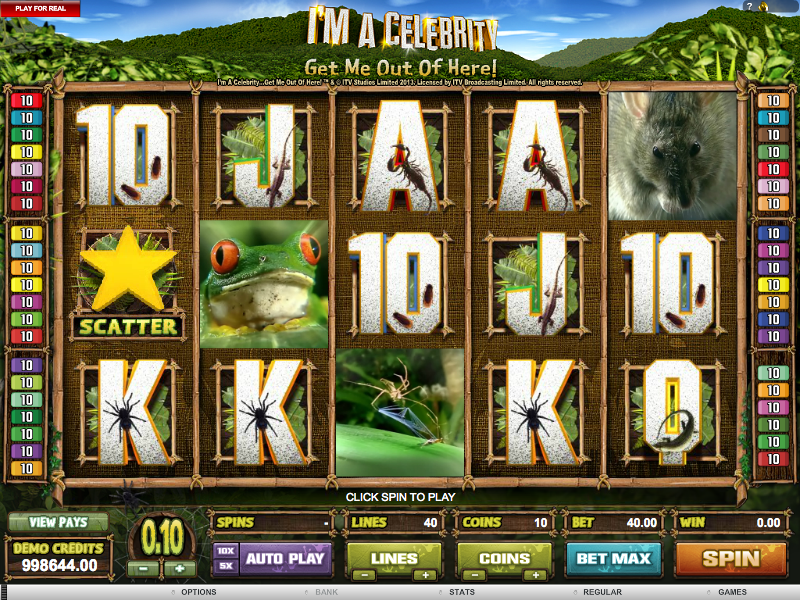 This Microgaming slot is based on that show. I’m A Celebrity! 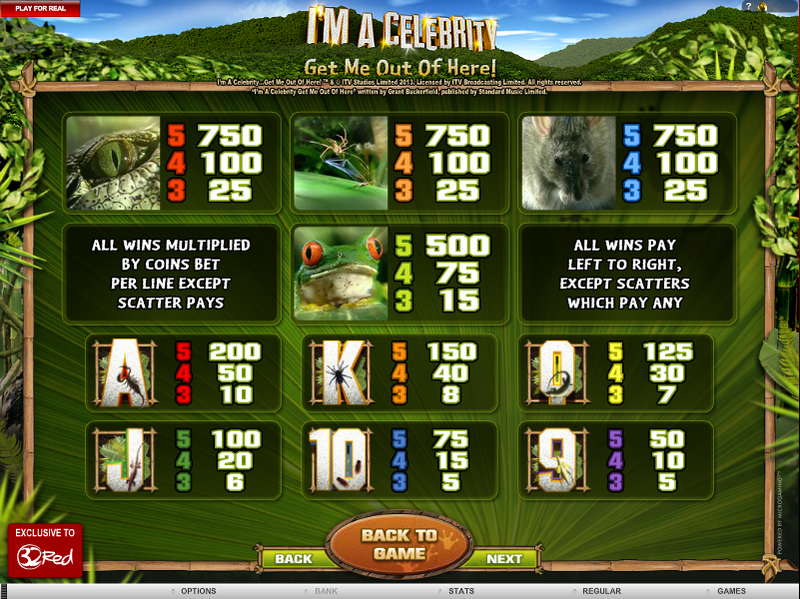 is a five reel slot with forty paylines and it’s designed to complement the television show in terms of graphics, animations and sound effects. The reels spin in a bamboo frame in front of view of a blue sky and forested hills. Four creatures represent the four main symbols and these are a frog, a rat, a spider and an alligator’s eye. 9, 10, J, Q, K and A are the lower values. The game’s logo (and the TV show logo) is the wild symbol and it’s stacked in the base game and free spins which means they appear on top of each other, hopefully providing more winning opportunities. The gold star is the scatter symbols which activates the feature. The video above shows our choice of 25 free spins with the appropriate multiplier; you will also notice that we landed three more scatters during those spins but unfortunately you can’t re-trigger any more. Your choice of spins really reflects whether you like low or high variance slots and how much time you have to spare watching fifty spins do their business. We’re happy with a middle-of-the-road twenty five spins. We can’t help feel that a television show made up of loads of little games could have influenced this slot a little more; as it is there’s just the one feature. Nevertheless this is a high quality game with lots to recommend it.